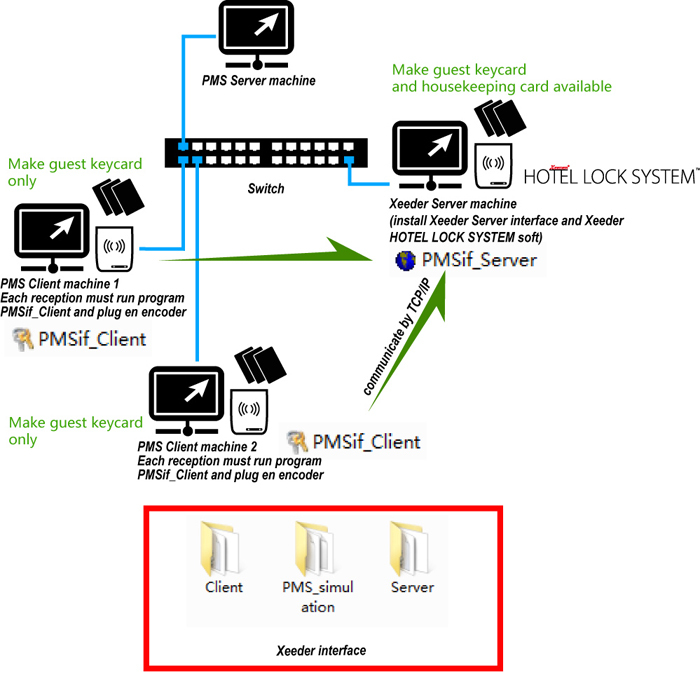 All Xeeder hotel lock product could work compatible with PMS（Property Management System）. Hotels should prepare a machine especially for Xeeder interface Server. 2.Set TCP/IP communication: PMSif_Server must connect to your hotel PMS server(likes Fidelio Server). All PMSif_Client connect the PMSif_Server, Each PMSif_Client must set different Encoder Number likes 1-10, to let Client different with others. 3. Set Database: Click Import Database on PMSif_Client, all PMSif_Client make the same DATABASE. 4. Save the about set, it will be auto use. 5. Open "Server setting" and "Import Database" you could see the connect Server and database stutas if OK. In the "PMS Setting" of PMSif_Server, you could check if it connect to PMS Server machine well. 7.PMS_simulation is a simulate program to simulate a PMS server machine, only for test program.